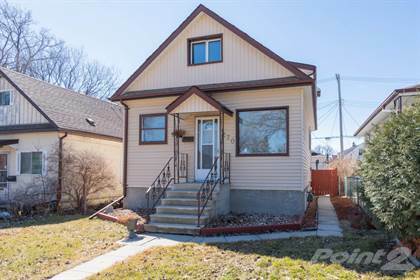 I am interested in 40 Snowdon Ave, Winnipeg, MB. 40 Snowdon Ave is a 672 square foot House for sale in Winnipeg, MB R2K3G8. It has 3 beds, 2 baths and was listed on Ovlix.com since April 16, 2019 by Re/max One Group for $199,000. Listing agent: Tori Rowinski. The average price for similar 40 Snowdon Ave real estate listings - $294,877 which is 29% lower than $414,767 for Winnipeg, and 22% lower than $378,485 for Manitoba. Comparable nearby homes are: 162 Thom Ave, 261 Winterton Ave, 736 Valour Rd, 756 Harbison Ave E, 519 Washington Ave. What's near 40 Snowdon Ave, Winnipeg R2K: Manitoba Pioneer Camp, Chief Peguis Junior High, Immanuel Christian School (Winnipeg), Concordia (electoral district), Bernie Wolfe Community School, Kildonan Place, Munroe Junior High/ École Munroe, École Regent Park School, Kil-Cona Park.